Is there a building left in Melbourne without a rooftop bar? Look up the next time you leave your house – that martini you're craving may be closer than you think. 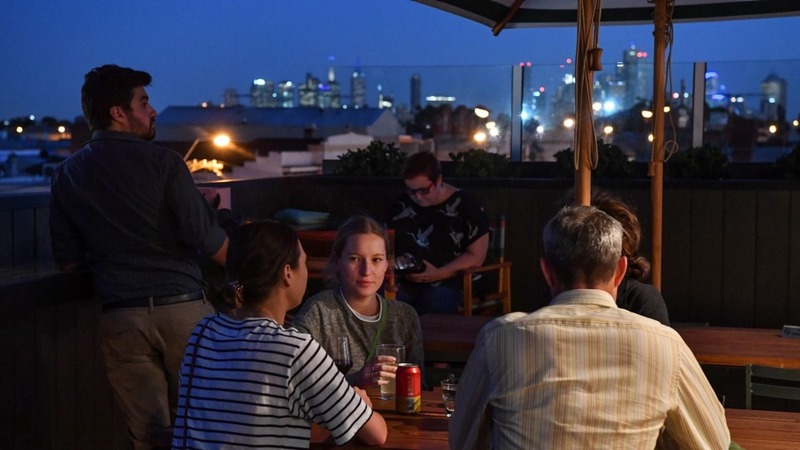 The proliferation/infestation may be intense but the saving grace with Melbourne's rooftop bars (aside from booze and view) is they're expensive and time-consuming to set up. You have to be committed and this keeps the rooftop satisfaction level in this town pleasingly high. Views might distract people from sloppy cocktails and lazy beer initially but the increased choice means they can now move on to bars like the recently-opened one above The Cornish Arms where they give as much thought to what they're serving as where they're serving it. The "where" in this case is on Sydney Road in Brunswick, within the vegan heartland. The Cornish Arms clocked the demographic a while back and has become a go-to boozer for those who like to mix their beer with a mock chicken parma or a vegan souvlaki. In the interests of peaceful omnivore/vegan co-existence there's always been plenty for the non-vegan, too, and this approach has been carried up the two flights of steep stairs to the smartly kitted out rooftop with its sensational views of Brunswick and city skyline. Designed by Wendy Bergman (who recently did a bang-up job with South Yarra's handsome leathery steakhouse Angus & Bon), the CA's rooftop bar is a humorous, good-looking timber-decked combo of deckchairs with matching striped canvas umbrellas, fairy-lit greenery, pegboard menus and an excellent bar clad in recycled suburban roof tiles patterned with lichen. There's a small kitchen down one end of the bar that pumps out broad spectrum bar snacks from Korean fried chicken to Korean fried cauliflower. Yakitori embraces both tofu and wallaby and there are excellent fries in paper bags, something we can all agree on. You should drink cocktails here. The team, led by manager Josh Heuer, know what they're doing and they're doing it as much as possible with Australian spirits. A bottled Negroni pulls Brunswick's own Patient Wolf gin together with amaro made by South Australia's Applewood distillery. They're still working on a local vermouth, currently eyeing off Victorian fave Maidenii. Ask for a martini and they might suggest using Applewood's juniper-forward Gin of Sloth (part of Applewood's Seven Deadly Gins series). Go-to drink is the Southside Sting. 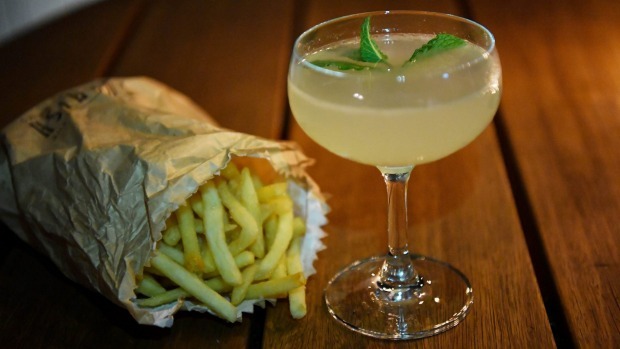 It mixes Brookie's gin from Byron Bay, mint, muddled ginger, lime and a dash of sugar. Shaken with ice, strained into a coupe and garnished with fresh mint, it's a drink made for a deckchair on a rooftop. Cocktails can be re-jigged for the vegans. The Amaretto Sour, for example, swaps chickpea brine for egg whites without skipping a beat. On tap there's a solid collection of beer that favours the local (Furphy, Two Birds, Coldstream) while the price-conscious wine list goes decent over dazzling. The view brings the dazzle, though. Carousing vegans against a backdrop of city lights. It's a moment of peak Brunswick. They understand chill and are super happy to customise. Go-to bar snack Good fries, served in a bag with a choice of chicken salt, salt and vinegar or barbecue, are a happy-making bonding snack for vegans and non-vegans alike.